Credit: Prof Annemariè Avenant-Oldewage, Department of Zoology, University of Johannesburg. Everyone needs safe and clean water to drink. Yet industry, agriculture and urban activities threaten fresh water. In particular, metal pollution can be very hard to detect early. Because of this, scientists are always searching for sensitive indicators of water quality. 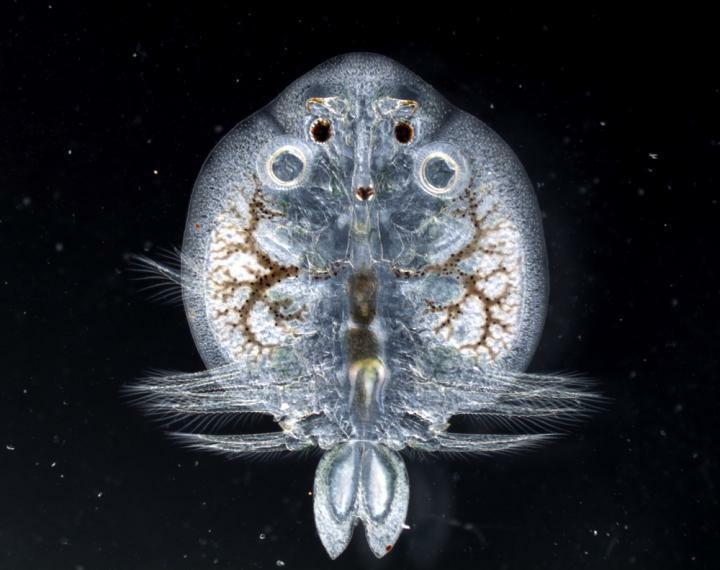 Now, a fish louse shows great promise as an early indicator for monitoring pollution in rivers and dams. Water samples only tell the story of a river for a moment in time. So researchers studied fish, because fish accumulate pollutants such as metals over time. But it can be difficult to get a complete story from fish also, says Prof Annemariè Avenant-Oldewage. She heads the Department of Zoology at the University of Johannesburg. "Fish have mechanisms to protect themselves. They can reduce the toxic effects from metal pollution inside their bodies. They move the metals they accumulate to organs or other body parts where it is less harmful to them. Because of this, we cannot detect very low levels of metals by analysing fish. "Also, if the fish have parasites, the parasites can accumulate the metals better than the fish. Tapeworms are an example of such internal parasites. "In a way, the parasites absorb the metals from the fish. The parasites can then end up with metals in much higher concentrations than those in the host. For some internal parasites, levels of metals have been found to be up to 2 500 times higher than in the host," says Prof Avenant-Oldewage. "This means we can measure metals in them, long before it is possible to do that in fish or in water samples. So parasites can give us early warnings of pollution." In follow-up research, Prof Avenant-Oldewage and her team studied tape worms. Tape worms live inside the intestines of fish, but they are not ideal. The host fish they live in has to be killed to analyse for accumulated pollutants. Added to that, the researchers found that tape worms also have a way to get rid of metals. An egg-bearing tapeworm can move metal pollutants in its body, into the egg shells it is about to release. As an alternative, the researchers then considered external fish parasites. If these work, no fish would need to be killed. Next, Prof Avenant-Oldewage's team studied an external parasite called Paradiplozoon. The parasite lives on the gills of fish. "Like most parasites, Paradiplozoon are picky eaters. They will only live on two species of yellowfish. Those yellowfish are only found in the Vaal River. So they would not be versatile indicators for water quality. "Yellowfish is prized as a fighting fish for angling competitions. But they are physiologically sensitive creatures. They go into shock if someone removes parasites from their gills." This is where the fish louse, Argulus japonicus , enters the picture as a possible early indicator. Argulus japonicus lives in many kinds of freshwater and marine environments. It is a crustacean, a cousin of shrimp. It lives on the skin of many species of fish, but is also able to swim in search of a host. Because it infects the skin of its host, researchers can remove it without injuring the fish. All these abilities make it a versatile option. In their latest study, the researchers analysed Argulus lice from the Vaal River. They wanted to see what fish lice do with the metals they accumulate. Dr Beric Gilbert caught mudfish and yellowfish in the Vaal Dam, close to Deneysville. Then he removed Argulus lice from the fishes. He froze the parasites, applied stains, and used a microscope with fluorescent functions. Then he could see areas in male and female lice that had higher concentrations of metals. "Most of the metals were in the hard outer layer of the lice, also called the exoskeleton. There wasn't much difference in the amount of metals absorbed by male and female Argulus ," says Dr Gilbert. The more intense the fluorescent signal, or glow, produced by the microscope, the higher the amount of metals accumulated in those areas of the lice. "Male lice seemed to concentrate more metals in the exoskeleton covering the underside of their bodies. This was visible as a brighter yellow signal, or intense glow, when studying the parasites with the microscope. "But in egg-bearing females, a layer of jelly around the eggs produced a positive signal, indicating the presence of metals. The female uses the jelly to secure the eggs to surfaces in the environment, when she lays them," he says. Argulus fish lice do not qualify as good freshwater indicators yet, says Prof Avenant-Oldewage. "Our next step is to find out what mechanisms the lice use to protect themselves from metals. We also need to find out how they absorb metals in the first place," she says. "If Argulus japonicus fish lice succeed, they could become sensitive, living metal indicators in the future. That way, we could detect metal pollution long before fish are affected. There could still be time to do something about it." For broadcast interviews, contact Ms Therese van Wyk, +27 71 139 8407 (mobile) or +27 11 559 6332 (office) or [email protected] in Johannesburg, UTC + 2. The research was funded by National Research Foundation (Grant nr. 80789) and the Faculty Research Council of the University of Johannesburg (Grant nr. SASOLD-0107) to Prof Avenant-Oldewage. The Spectrum analytical facility at the University of Johannesburg provided infrastructure for acquiring images of sections. The University of Johannesburg provided postdoctoral funding (GES PDRF bursary) to Dr Gilbert.